Based on the feedback we have received from our customers, we have introduced the ability for registered users to submit comments to organisers privately. 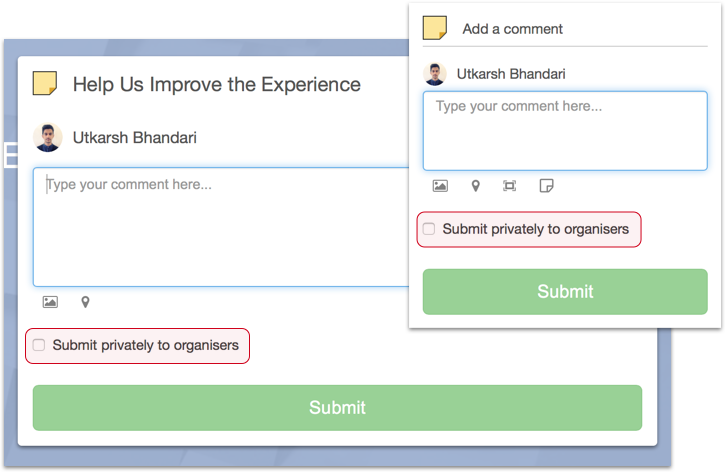 While making a comment (on a slide or otherwise), the members of room can submit their comment privately so it is only visible to the organisers, and hidden from all the other members in the room. This option is now available for both publicly and privately accessible rooms. Our enduring aim is to make our platform as flexible as possible. Users can already view a public activity and submit a comment anonymously. They don't need to sign in and register, and their comment will be recorded from a 'Public Visitor'. This new feature builds on these capabilities, by enabling a registered user - someone who has signed in with their details and email address - to submit a comment privately. So, with this update, we are enabling users to participate in your consultations, forums and other activities in the way they feel most comfortable. If they want to share sensitive comments with you, they can do so privately.